Merchandise design for Brigid's Well. I worked with renowned author Carl McColman on this design promoting awareness of John Barleycorn, and it features a bit of Celtic knotwork worked with dual barley heads (two being the duality of many pagan gods/goddesses, showing their mascualine and feminine nature). The font you may recognize as inspired from a certain favorite movie of mine featuring wicker and The Equalizer... and that's the only hint I'm giving! 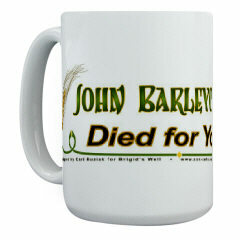 ;-) Featured here are the long sleeve t-shirt and the large mug, but there are many other products available with the design on them at the "John Barleycorn Died for You!" cafepress store.